Rich's resin kit includes the body, frame, belly pan, hood, and engine. Rich crowned his build-up with a windshield from an AMT/Ertl 1932 Phantom Vicky kit. A Revell 1932 Ford kit provides all the needed suspension parts. 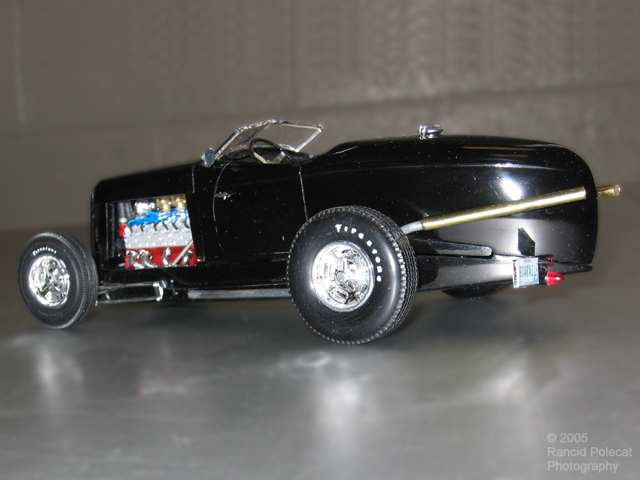 Rich used an unidentifed set of wheels from his partsbox (we know they are not from a Revell 1932 Ford kit) surrounded by rear tires from an old Indy roadster kit and skinny AMT/Ertl Firestone front tires. Rich hand bent the aluminum exhaust pipes that run from the headers, through the frame rails, and along the boattail contours to end in brass tips.